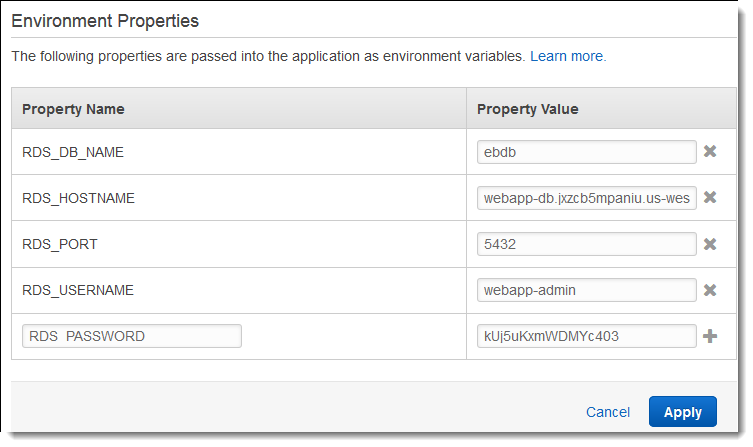 This tutorial walks you through the process of launching an RDS DB instance external to AWS Elastic Beanstalk, and configuring a high-availability environment running a PHP application to connect to it. Running a DB instance external to Elastic Beanstalk decouples the database from the lifecycle of your environment. This lets you connect to the same database from multiple environments, swap out one database for another, or perform a blue/green deployment without affecting your database. The tutorial uses a sample PHP application that uses a MySQL database to store user-provided text data. The sample application uses configuration files to configure PHP settings and to create a table in the database for the application to use. It also shows how to use a Composer file to install packages during deployment. The procedures in this tutorial for Amazon Relational Database Service (Amazon RDS) tasks assume that you are launching resources in a default Amazon Virtual Private Cloud (Amazon VPC). All new accounts include a default VPC in each region. If you don't have a default VPC, the procedures will vary. See Using Elastic Beanstalk with Amazon Relational Database Service for instructions for EC2-Classic and custom VPC platforms. To use an external database with an application running in Elastic Beanstalk, first launch a DB instance with Amazon RDS. When you launch an instance with Amazon RDS, it is completely independent of Elastic Beanstalk and your Elastic Beanstalk environments, and will not be terminated or monitored by Elastic Beanstalk. Use the Amazon RDS console to launch a Multi-AZ MySQL DB instance. Choosing a Multi-AZ deployment ensures that your database will fail over and continue to be available if the master DB instance goes out of service. Choose Databases in the navigation pane. Choose a database engine. Choose Next. Choose a use case, if prompted. DB instance class – Choose an instance size that has an appropriate amount of memory and CPU power for your workload. Multi-AZ deployment – For high availability, set to Create replica in different zone. Master username and Master password – The database username and password. Make a note of these settings because you'll use them later. Under Database options, for Database name, type ebdb. Make a note of the Database port value for use later. Verify the default settings for the remaining options, and choose Create database. Next, modify the security group attached to your DB instance to allow inbound traffic on the appropriate port. This is the same security group that you will attach to your Elastic Beanstalk environment later, so the rule that you add will grant ingress permission to other resources in the same security group. Choose the name of your DB instance to view its details. In the Connectivity section, note the Subnets, Security groups, and Endpoint shown on this page so you can use this information later. Under Security, you can see the security group associated with the DB instance. Open the link to view the security group in the Amazon EC2 console. In the security group details, choose Inbound. For Type, choose the DB engine that your application uses. For Source, type sg- to view a list of available security groups. Choose the current security group to allow resources in the security group to receive traffic on the database port from other resources in the same group. Creating a DB instance takes about 10 minutes. In the meantime, create your Elastic Beanstalk environment. Use the AWS Management Console to create an Elastic Beanstalk environment. Choose the PHP platform and accept the default settings and sample code. After you launch the environment, you can configure the environment to connect to the database, then deploy the sample application that you downloaded from GitHub. All of these resources are managed by Elastic Beanstalk. When you terminate your environment, Elastic Beanstalk terminates all the resources that it contains. The RDS DB instance that you launched is outside of your environment, so you are responsible for managing its lifecycle. Add the security group of your DB instance to your running environment. This procedure causes Elastic Beanstalk to reprovision all instances in your environment with the additional security group attached. Under EC2 security groups, choose the security group to attach to the instances, in addition to the instance security group that Elastic Beanstalk creates. Read the warning, and then choose Confirm. To add a security group using a configuration file, use the securitygroup-addexisting.config example file. Next, use environment properties to pass the connection information to your environment. The sample application uses a default set of properties that match the ones that Elastic Beanstalk configures when you provision a database within your environment. In the Environment properties section, define the variables that your application reads to construct a connection string. For compatibility with environments that have an integrated RDS DB instance, use the following. RDS_HOSTNAME – The hostname of the DB instance. RDS_PORT – The port on which the DB instance accepts connections. The default value varies among DB engines. RDS_DB_NAME – The database name, ebdb. RDS_USERNAME – The user name that you configured for your database. RDS_PASSWORD – The password that you configured for your database. Finally, configure your environment's Auto Scaling group with a higher minimum instance count. Run at least two instances at all times to prevent the web servers in your environment from being a single point of failure, and to allow you to deploy changes without taking your site out of service. In the Auto Scaling Group section, set Min instances to 2. Now your environment is ready to run the sample application and connect to Amazon RDS. Deploy the sample application to your environment. The site collects user comments and uses a MySQL database to store the data. To add a comment, choose Share Your Thought, enter a comment, and then choose Submit Your Thought. The web app writes the comment to the database so that any instance in the environment can read it, and it won't be lost if instances go out of service. The sample application uses configuration files to configure PHP settings and create a table in the database if it doesn't already exist. You can also use a configuration file to configure the security group settings of your instances during environment creation to avoid time-consuming configuration updates. See Advanced Environment Customization with Configuration Files (.ebextensions) for more information. For development and testing, you might want to use the Elastic Beanstalk functionality for adding a managed DB instance directly to your environment. For instructions on setting up a database inside your environment, see Adding a Database to Your Elastic Beanstalk Environment. If you need a high-performance database, consider using Amazon Aurora. Amazon Aurora is a MySQL-compatible database engine that offers commercial database features at low cost. To connect your application to a different database, repeat the security group configuration steps and update the RDS-related environment properties.